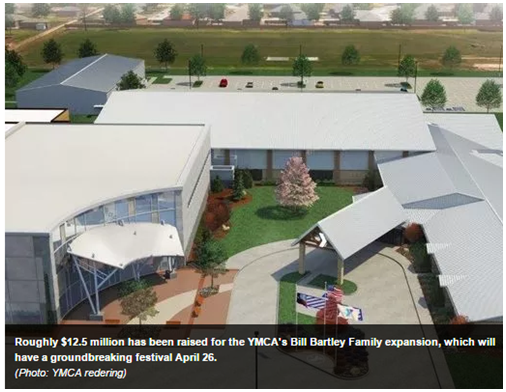 ​​​​​​​WICHITA FALLS – A groundbreaking ceremony will be conducted on April 25, 2017, on a $14 million building project at the Bill Bartley Family YMCA Branch. The work will add 80,000 sf of what is billed as family-friendly, energy efficient facilities to the Family Y. A new road on the south side of the property will lead patrons to a large parking lot in the back with 200 additional parking spaces. To date, more than $12.5 million has been raised on this project, toward a goal of $13,500,000. Actual project costs are projected to be $14.2 million. ​Want mor​e data? See Wichita Falls Overview Market Research.